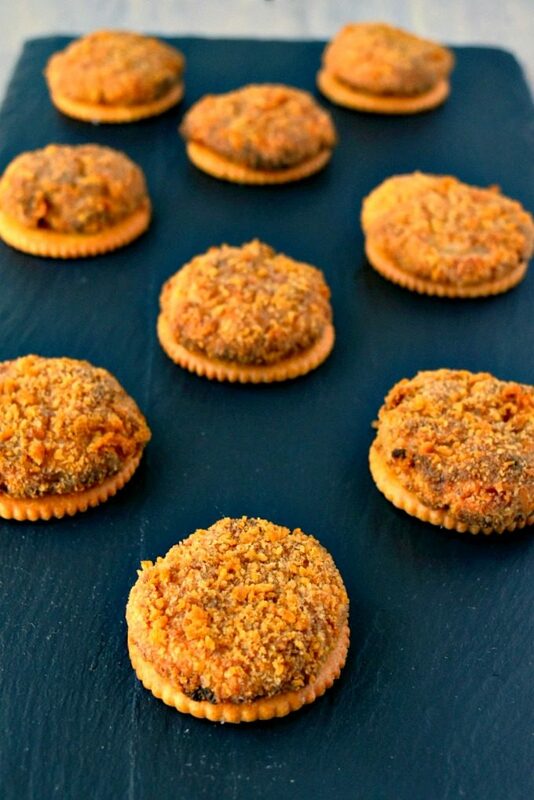 These Crab Cake Bites have all the flavor of their bigger counterparts in a fun, cracker sized bite. I have not had such a great relationship with seafood. Growing, I think I was related Bubba Gump. I would eat shrimp three ways from Sunday, but not much else. Fish? ICK! Crab? Not so much. Clams or oysters? No way!! Then Howard Johnson’s came along and they had all you can eat clam strips and scallops. Shrimp of course, but I already like those. Clam strips are so delicious with their sweet, tender, and slightly chewy flavor. And then there’s scallops with their completely unique and amazing flavor. I was hooked on those two for quite some time. Then the all you can eat seafood place opened. I would have my fill of popcorn shrimp. I didn’t want to have anything to do with the crab legs they were serving. Except to crack the crab for the rest of the family. Honestly. I would sit there, eat my popcorn shrimp, and crack crab legs. I’m pretty darned good at cracking crab legs, too. I know how to maneuver and manipulate the shell to get large pieces out of even the most difficult legs. I don’t remember the exact point in which I decided I liked crab, or oysters, or fish for that matter. The closest I got to eating fish was Arthur Treacher’s. Thankfully, my parents kept getting me to try these delicious gems every now and then. My tastes finally changed and I love them all. Well, maybe not LOVE oysters…or salmon. Of all the types of seafood there is, I’d have to say diver scallops are my most favorite. Yes. I know. This isn’t a scallop recipe. I’ve made quite of a few of those in my blog life. I don’t think I could every get enough of those succulent little shellfish. Next to scallops, crab cakes are probably the next favorite seafood recipe I love. The sweet crab combined with the spices and crispy coating. I could eat a crab cake once a week and I’d be happy. There’s a restaurant I used to go to every now and then. They have the best crab cake and filet. No matter what time of day, year, or what I thought I might want when I walk through their door, I always order it. The crab cake is packed with succulently sweet crab and has the crispiest coating every. I’m drooling just thinking about it. Just like these little crab cake bites. They have a super crispy crust that’s made with flavorful garlic butter crackers. There’s sweet crab with some kicked up flavors inside. They’re the perfect little bite of crab tastiness. What’s your favorite way to serve crab? Combine first nine ingredients (cream cheese through cayenne) in a mixing bowl. Fold the crab into the cream cheese mixture. Using two spoons or a small cookie scoop, drop into the cracker crumbs and carefully roll around to coat. Carefully pat the balls for form a small crab cake. Place the bites on a baking sheet covered with aluminum foil coated with cooking spray. Continue rolling the mixture in the cracker crumbs and forming small crab cakes. Bake the bites at 400 for 15 to 20 minutes or until golden brown. Serve on top of crackers for easier bites. I love the idea of a bite sized crab cake! This look so delicious! And I love Old Bay seasoning! I do, too! It’s so good. And their garlic lemon one is even better! Crab Cakes are a family favorite and this is the perfect way to serve them for a cocktail party. We live in Maryland where Crab is King but I still marvel when I see a gorgeous presentation. I’m craving these now…. Mmmmm Maryland crabs are DA BEST! Being in NoVA we get some blue crabs, too. I am not so adventurous with seafood myself. It seems everyone likes something different doesn’t it. I do however love crab though I don’t make crab cakes very often. These look so delicious and I think I may try this for my next book club. Great post! Thank you! I’m totally picky about seafood. LOL You should try these with the garlic butter Ritz, though. Makes them DELICIOUS! What a fun, tasty idea! I was never too crazy about seafood either. Now I eat some mild white fish, crab only in dips or my husband’s crab cakes, and a few others things. However, I think these crab cake bites would definitely be on my approved list of crab! If I like them, you’ll like them. It’s the garlic butter Ritz that makes them delicious, well, and a few other things. But those Ritz are crack in a cracker. I can’t stop eating them. These are going on my next party menu! LOL I remember the Howard Johnson’s fried clams! When I was a teen my best friends mother worked there and we would get them for lunch once in awhile. I haven’t had a crab cake in ages. These look so good. Thank you! Yes! I’m not the only one. They were THE thing when I was growing up. All you can eat seafood… Those were the days. My hubby is slowly coming around, too! I love crab cakes and your bites look like a fun appetizer!! P.S. I remember my parents taking us to Howard Johnson’s for seafood, too! Thank you!! YES! Another one! I love that I’m not alone in this HoJos memory. I can eat crab anyway any time of day, love these little bites. If it’s good crab, I could, too. I could pound me some crab legs. Those things are addictive!